Jean M. Cogdell grew up in a small SC town, near the Great Smoky Mountains. She is a wife, mother, Oma, a writer and a book lover. Her stories and essays are available in various publications. She currently lives in Texas. Check out her website www.jeanswriting.com for more. 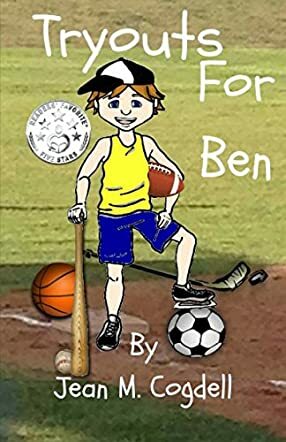 Tryouts for Ben by Jean M Cogdell is a cute storybook for children where they find themselves relating with the woes of the main character, Benjamin Wade Marshall, who spends too much time playing video games. His parents want him to get out of his room and try out some sport but Benjamin is not interested. He does not have the confidence to do something which he is not good at. But then with the help of his encouraging parents, he starts trying out new sports and realizes that with determination, perseverance and hard work, anything can be achieved. The book is uplifting for all kids who want to try out new things in their lives and lack confidence to do so. The message in the book is excellent, as is the concept too. The author reaches out to young readers with an engaging and entertaining story laced with humor. Benjamin is a lovable boy and his character is real and relatable. Parents and grandparents can read it out during bedtime to their kids and grandkids and it is also good for read aloud sessions in classrooms and school libraries. The illustrations are adorable and they complement the author's words nicely, breathing life into the scenes. Book with a good concept like this are a must-read for children to encourage and motivate them to do new things in life. Teaching a concept through a story is ideal as it will help children understand it better and this book does just that.